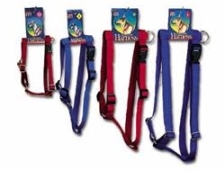 Harnesses are adjustable around both the neck and the chest. Kwik klip buckles allow harness to be fitted and removed quickly. These comfortable harnesses can grow with the dog. Harnesses are adjustable around bothe the neck and the chest. Kwik klip buckles allow harness to be fitted and removed quickly. These comfortable harnesses can grow with the dog.